Westside Theatre Reviews: Broadway Rose’s Oklahoma Climbs Clear Up To The Sky! Almost fifty years ago, a high school sophomore ambled onto the stage at the San Gabriel Playhouse and sang “There’s a bright golden haze on the meadow...” and for me, it was the beginning of a lifelong love affair – not with the actor, but with the show. 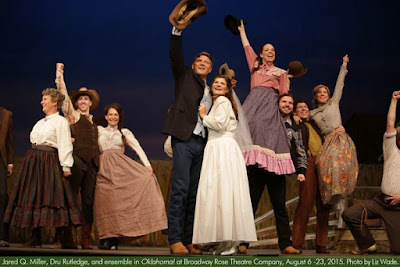 The current Broadway Rose production of Rodgers and Hammerstein’s sweeping epic Oklahoma reminds me of why this beautiful musical captured and has held my heart for half a century. The setting, and the sets, of Oklahoma evoke an image of a golden time in American history when everything seemed possible, when people willing to take risks, work hard, and look out for their neighbors could be rewarded with a secure and happy future for themselves and their families. Of course there is much mythology in the image – one has to suspend for a couple of hours one’s 21st century sensibilities to environmental destruction and the oppression of indigenous people (not that there are any in the show – but the “open” land was not ceded voluntarily by the Five Civilized Tribes!). Oklahoma is a show about dreams – of freedom to plant crops, raise cattle, and build a community, of a surrey pulled by snow-white horses, of skyscrapers in Kansas City, of exotic truths emerging from a peddler’s smelling salts – and some of the show’s biggest songs pull the audience like a tractor beam right into the magic. When it comes to Broadway style musicals, few local theatre companies can even hope to compete with Broadway Rose’s big summer productions. Director Sharon Maroney’s experienced hand ensures that the Oklahoma audience will see and hear a consistently professional, first-class show – elaborate and evocative sets, effective lighting, superb leads and vocal ensemble, crisp choreography, and an orchestra to die for. Jared Miller (“Curly”) and Dru Rutledge (“Laurey”) bring years of training and experience to their roles. Their voices blend beautifully, and “People Will Say We’re In Love” is a simply breathtaking duet. If anything, they are a bit too good – it can be hard to reconcile their clear and flawless voices with the earthy pioneer and cowboy they portray. My personal pick for best performance goes to Megan Carver, whose “Ado Annie” somehow manages to be both naïve and experienced, a free-thinking inadvertent feminist with a simple sexuality that sells “I Cain’t Say No!” as a comic masterpiece. Another standout is Colin Wood (“Jud Fry”) who manages to convey a little of the pathos of his role as perennial underdog without losing his character’s menacing foundation. The strength of the ensemble is eye opening in “Many a New Day” – the solos by several of the “girls” clearly show voices and attitudes that would do credit to lead roles in any big musical, and there are places where the female vocal ensemble has an almost Disney-like clarity and musicality. Special recognition must go to choreographer Maria Tucker for the “Dream Sequence” – the dark ballet of Laurey’s nightmare often comes across as a jarringly psychedelic intrusion from a bad horror movie, but Tucker’s ballet is a more balanced blend of beauty and violence. Props for restraint also are due to Brynne Oster-Bainnson, whose costume design is refreshingly subdued, reflecting the earth tones and homespun fabrics that would have been available to the people of the frontier. Once again, Broadway Rose has shown that they know their audience by delivering a beautiful production of a true classic, and the reward is the enthusiastic response of a truly appreciative public. Broadway Rose’s Oklahoma runs through August 23d at Tigard High School’s Deb Fennell Auditorium.